Rongotai College students are encouraged to get involved in the vibrant cultural life of the school. 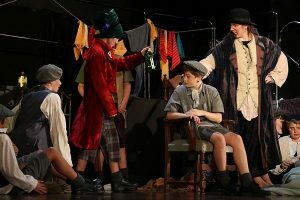 Stage Productions – in 2009, the school performed “Bugsy Malone” in conjunction with students from Wellington East Girls’ College and in 2010 performed a selection of Cabaret Classics. 2011 saw the school perform ‘Joseph and the Amazing Technicolor Dreamcoat’ in conjunction with students from Queen Margaret College, St Catherine’s College, Wellington East Girls’ College and Seatoun School. In 2013 “Jesus Christ Superstar” was performed in conjunction with students from Wellington East Girls’ College, St Catherine’s College and Wellington High School. In 2015 “Grease” was performed in conjunction with students from Wellington East Girls’ College and St Catherine’s College. Musical Performance, such as the Jazz Band, show orchestra, Barbershop and the Ukulele Orchestra. Poly Club and Kapa Haka are significant cultural groups which operate in the college. These groups play an important role within the wider school, both as a cultural link for Māori and Pasifika students and as a view into the Māori and Pasifika worlds for other students.